The latest release is 1.9.2 which has bug fixes. 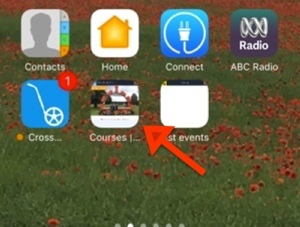 Courses recorded with 1.9 and shared via email or Airdrop cannot be read by earlier versions of CrossCountry App. Users will receive a message when they try to open the course, explaining that they need to do the free upgrade. If you have both the full version of CrossCountry App and Lite, courses will default to download in "Full" . Email us your name and country to get a login/password. Then your courses will be uploaded directly to our library. Especially useful for event organisers and riders who want to share your course with other riders during a competition, or if you have a lot of photos, audio or videos in the coures which can make it too large to email.. Without a login, your course is emailedl to us and we publish it.